Stems: Erect, simple or usually much branched at base and above, nearly glabrous to densely stiff-hairy. Leaves: Variable; basal leaves oblanceolate, often in rosette, .5 to 3.5 inches long, .5 to 1 inch wide; stem leaves alternate, short-stalked, linear-oblanceolate to narrowly elliptic, 1 to 4.75 inch long, .2 to 1.2 inch wide; nearly glabrous to fine hairy, sometimes long hairy; margins deeply lobed or wavy-toothed, sometimes nearly entire. Inflorescences: Solitary flowers in upper leaf axils; buds erect or nodding. Flowers: Floral tube .6 to 1.6 inch long, sparsely pubescent; sepals 4, green to yellowish green, 1/5 to 1/2 inch long, bent backward; petals 4, yellow, fade pinkish, obovate, 1/5 to 3/4 inch long, apex notched; stamens 8, unequal, nearly as long as petals; style as long or longer than surrounding stamens. Fruits: Capsule, cylindrical, usually spreading, .5 to 1.5 inch long, fine hairy and with sparse long hairs; seeds narrowly egg-shaped, brown. Habitat: Waste places, pastures, fields, open woods, stream valleys, and roadsides. 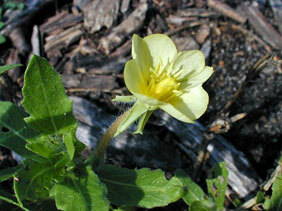 Comments: Cutleaf evening-primrose is a common weedy species. The flowers open near sunset and remain open through mid-morning.